1.How do Paul’s troubles help advance the Gospel? How does this perspective impact the way you respond to hardship? 2.Joy is not the absence of sadness. We can be sad and be joyful. We can grieve and have joy. When have you experienced joy in the midst of hardship and adversity? 3.People say that in the midst of hardship and trouble, joy is a choice we make. While this is true, it’s also true that joy chooses us. What does this mean to you? 4. 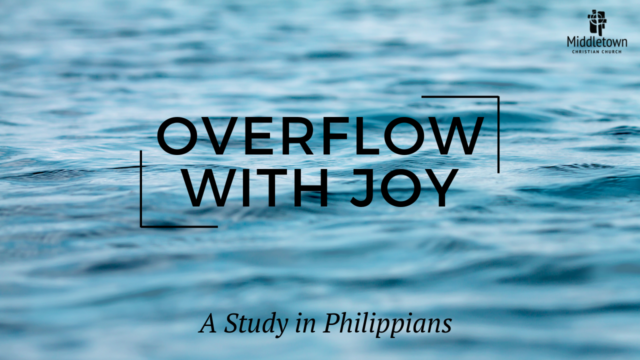 Paul wants to help the Philippians grow and experience the joy of their faith. What does experiencing the joy of your faith look like for you? How are you currently experiencing the joy of your faith? Access the Overflow videos sessions and study guide here.